The State Water Board is updating the Safe Drinking Water Plan (the 2020 Plan) to include the topics from previous plans as well as topics recently added and signed into law. The requirements for the Safe Drinking Water Plan are set forth in Health & Safety Code Section 116355, which identifies the topics to be addressed and requires periodic updates. Recently, AB 2501 (Chu)(Statutes of 2018, Chapter 871) amended those requirements to add additional topics, including a review of the use of administrators for disadvantaged communities’ public water systems and an evaluation of the success of consolidation of drinking water systems. For all topics to be addressed, see “Statutory Requirements,” below). The development of the 2020 Plan will include several public workshops throughout the state in mid-2019, at which time there will be opportunities for public comment on the draft document. Public input at the workshops and via written comments was important in developing the 2015 Plan. More information on the 2020 Plan will be presented on this website as it becomes available. The 2015 Safe Drinking Water Plan for California includes the State Water Board's assessment of the overall quality of the state's drinking water, the identification of specific water quality problems, an analysis of the known and potential health risks that may be associated with drinking water contamination in California, and recommendations to improve drinking water quality. Preparation of the 2015 Plan included opportunities for public comment at workshops throughout California. Written comments were also invited (see Notice of Opportunity to Comment on the 2015 Plan). Comment letters are accessible here: Comment Letters on the Safe Drinking Water Plan. The process concluded with revisions, and the 2015 Plan was presented to the State Water Board (see Revisions to the 2015 Safe Drinking Water Plan - Board Meeting Presentation). 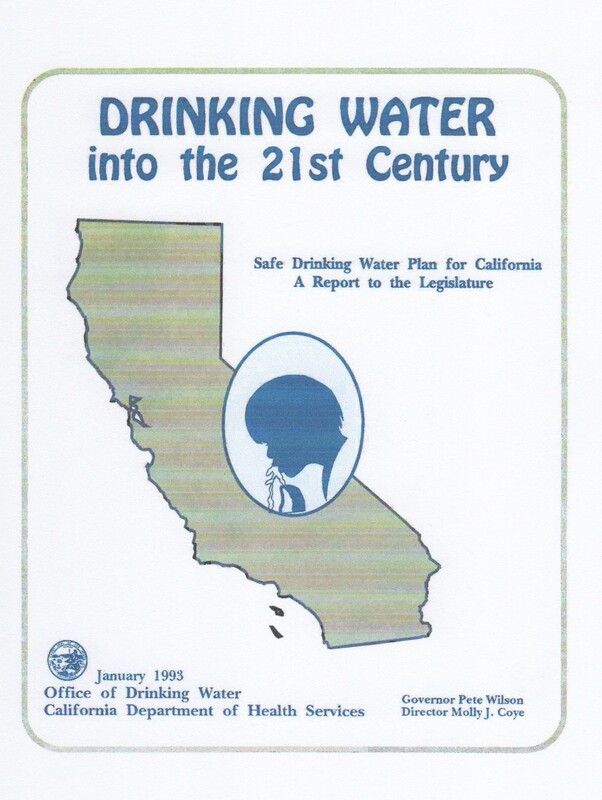 In 1993, the California Department of Health Services (CDHS) (now the California Department of Public Health, CDPH) submitted to the Legislature the report, "Drinking Water into the 21st Century: Safe Drinking Water Plan for California" (1993 Plan). The 1993 Plan is available at the link below. For the update of the Plan, CDPH assembled a team of experts that conducted extensive reviews and analyses, resulting in a draft plan that included an overview of drinking water regulation, reviews and plans for drinking water quality/monitoring and threats, treatment technologies, funding aspects and financial assistance, and a focus on the challenges faced by small drinking water systems. The 2014 transfer of the CDPH Drinking Water Program (DWP) to the State Water Board brought with it not only the primary enforcement authority (primacy) to enforce federal and state Safe Drinking Water Acts, and the regulatory oversight of ~8,000 public water systems throughout the state, but the responsibility for completing the next Safe Drinking Water Plan already begun by CDPH’S DWP. That draft plan was completed as the 2015 Plan by enhancing CPDH’s recommendations and implementation plan, based on public input received as well as the synergies and resources resulting from incorporation of the CDPH DWP into the State Water Board. The DWP is now the Division of Drinking Water. (1) An analysis of the quality of California’s drinking water and identification of specific water quality problems. (A) Estimated costs of requiring these systems to meet primary drinking water standards and public health goals. (B) Recommendations for actions that could be taken by the Legislature, the department, and these systems to improve water quality. (3) A discussion and analysis of the known and potential health risks that may be associated with drinking water contamination in California. (4) An evaluation of how existing water quality information systems currently maintained by local or state agencies can be more effectively used to protect drinking water. (5) An evaluation of the research needed to develop inexpensive methods and instruments to ensure better screening and detection of waterborne chemicals, and inexpensive detection methods that could be used by small utilities and consumers to detect harmful microbial agents in drinking water. (6) An analysis of the technical and economic viability and the health benefits of various treatment techniques that can be used to reduce levels of trihalomethanes, lead, nitrates, synthetic organic chemicals, micro-organisms, and other contaminants in drinking water. (7) A discussion of alternative methods of financing the construction, installation, and operation of new treatment technologies, including, but not limited to user charges, state or local taxes, state planning and construction grants, loans, and loan guarantees. (8) A discussion of sources of revenue presently available, and projected to be available, to public water systems to meet current and future expenses. (9) An analysis of the current cost of drinking water paid by residential, business, and industrial consumers based on a statewide survey of large, medium, and small public water systems. (10) Specific recommendations, including recommendations developed pursuant to paragraph (6), to improve the quality of drinking water in California and a detailed five-year implementation program. (11) A review of the use of administrators pursuant to Section 116686 in the state, including, but not limited to, the number of communities that have achieved access to safe drinking water through use of an administrator, the costs and duties of the administrator and a comparison of costs, whether rate structures for communities served by an administrator have resulted in significantly higher rates and whether those rates are affordable, and whether the administrator program should be modified to better serve communities. (12) A review of the consolidations pursuant to Section 116682 in the state, including, but not limited to, the number of communities that have achieved access to safe drinking water through consolidation, whether rate structures for communities are affordable following consolidation, barriers to consolidation, and whether the consolidation program should be modified to better serve communities. Questions about the Safe Drinking Water Plan for California?